A Small Piece of Local History discussed how our house, Ballynoe House, got its name. It also showed how it sits in the general landscape of the present-day Dunowen townland in Ardfield. The ancient history of Ireland goes all the way down to field level. As an example, the nearby Dunowen Farm has 33 fields, all with old Irish names, which the owner, Michael Scully (Felicity’s 5th cousin) has on a map. Many of these ancient field names are preserved only in memory and folklore, and are not found on any historical map. They have been preserved thanks to the knowledge of his father, Con. The same is the case of the sub-townlands of Dunowen. As they fall into disuse they can easily become forgotten. In 1837, Dunowen was a significant landholding of more than 500 acres belonging to Dunowen House. In the early-mid C20th, Dunowen usually referred to present-day West Dunowen, which was the fishing village adjacent to Red Strand. The other parts of Dunowen (“East Dunowen”) was divided into other-named sub-townlands, only one of which is still in use. Ballynoe House is named after the sub-townland of Ballynoe (Baile Nua, meaning Newtown). This community was built for his staff by George Sandes, owner of Dunowen House. 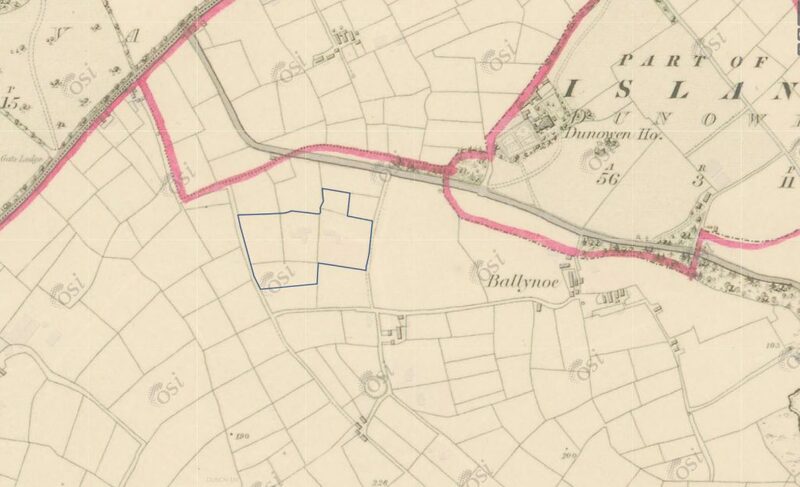 Ballynoe House (blue polygon on the map, below) overlooks the Ballynoe sub-townland but is not part of it, separated by the adjacent laneway. Clash (Clais, meaning furrow) was on the left of the road leading to Sandes’ Cove and included Dunowen House. Modern postal addresses place Dunowen House in the neighbouring townland of Farran rather than ancient Dunowen to which it used to belong. On the map, below, Dunowen House was part of the Island parish (i.e. Inchydoney), however townlands predate parishes by centuries. Sandescove (Tra na gCleireach, meaning Strand of the Clery’s or Clergy). Carhooleasa (Ceathru Leasa, meaning quarter fort) is the sub-townland on the western side of the laneway running south to Bulls’ Cove, which includes the area now occupied by Ballynoe House. Like most peninsulas on the Irish coast, there was an ancient fort at the highest point, and the sub-townland was named after it. Ballynoe House thanks, and acknowledges the local historical information provided by, Con Scully of Dunowen Farm.